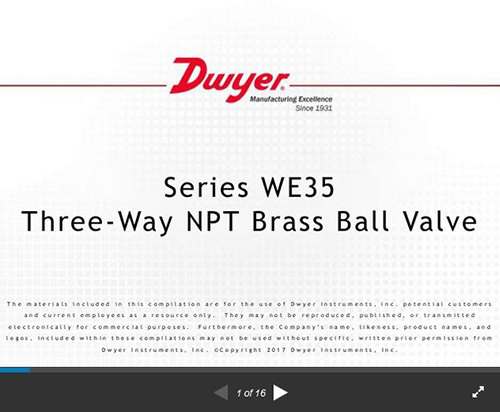 The SERIES WE35 incorporates a full port 3-way brass ball valve for great flow rates with minimal pressure drop. The valve features a blowout proof stem for added safety, reinforced PTFE seats and seals for longer life, and a brass ball for better performance. Actuators are direct mounted creating a compact assembly for tight spaces. The Series WE35 can be configured with either an electric or pneumatic actuator. Electric actuators are available in weatherproof or explosion-proof, a variety of supply voltages, and two-position or modulating control. Two-position actuators use the supply voltage to drive the valve open or closed, while the modulating actuator accepts a 4 to 20 mA input for valve positioning. Actuators feature thermal overload protection and permanently lubricated gear train. The pneumatic double acting actuator uses an air supply to drive the valve open and closed. The actuator has two supply ports, with one driving the valve open and the other driving the valve closed. Spring return pneumatic actuators use the air supply to open the valve and internally loaded springs return the valve to the closed position. Also available is the SN solenoid valve to electrically switch the air supply pressure between the air supply ports for opening and closing the valve. Actuators are constructed of anodized and epoxy coated aluminum for years of corrosion free service. 600 psi (41 bar) WOG. Body, ball, and stem: Brass; Seat, seal, and packing: PTFE. -20 to 425°F (-30 to 220°C). O-ring: NBR; Handle, stem nut, ferrule: SS; Handle Sleeve: Vinyl; Body and cap: Nickle plated. Meets the technical requirements of EU Directive 2011/65/EU (RoHS II). DA series is a double acting and SR series is a spring return (rack and pinion). DA02 to DA03: 1/4" female NPT; SR02 to SR04: 1/4" female NPT. Anodized aluminum body and epoxy coated aluminum end caps. -40 to 176°F (-40 to 80°C). 110 VAC, 220 VAC, 24 VAC, or 24 VDC (MD models not available in 24 VDC). TD01: 4 s; MD01: 10 s; TD02: 20 s). -22 to 140°F (-30 to 60°C). Manual override, position indicator, and TD models come with two limit switches. 110 VAC, 220 VAC, 24 VAC, 24 VDC. NEMA 7, designed to meet hazardous locations: Class I, Group C & D; Class II, Group E, F & G; Division I & II. -40 to 140°F (-40 to 60°C). Position indicator and two limit switches.